Rainbow flag hoisted at City Hall as Pride Week begins in Vancouver. Pride Week: Ceremony at City Hall. The Vancouver Pride Parade has gained Civic Parade status for the first time: This will come as a surprise to some: you'd be forgiven for thinking Vancouver Pride was already a civic event, considering it's one of the largest Pride parades in the world. 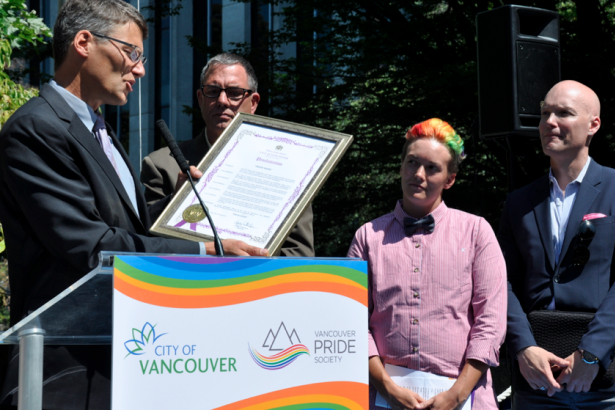 After reading the proclamation aloud, Robertson handed it to Vancouver Pride Society President Tim Richards and Vice-President Chrissy Taylor. 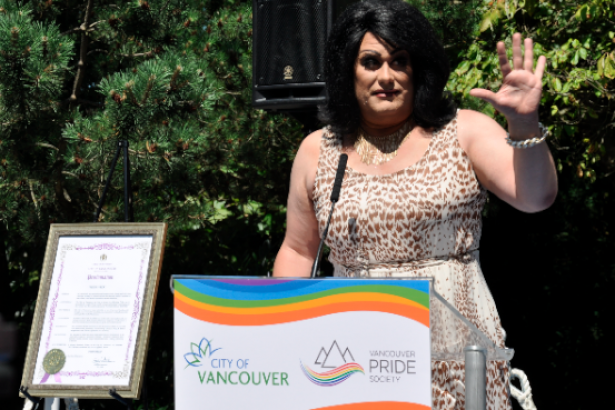 Also joining Robertson were openly-gay City Councillor Tim Stevenson and Zdravko Cimbaljevic, founder of the modern Montenegrin Pride movement and Grand Marshall of the 2013 Vancouver Pride Parade. 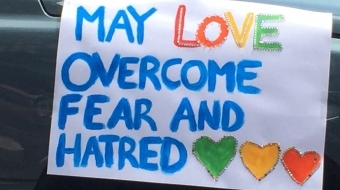 Montenegro saw its first-ever Pride event only a few days ago, which was marred by violence. Hooligans attacked the marchers, throwing bottles and rocks while chanting, "Kill the gays". Cimbaljevic gave a shoutout to Montenegrin police as well as supporters of his LGBTQ community, expressing hope for social equality in the future. 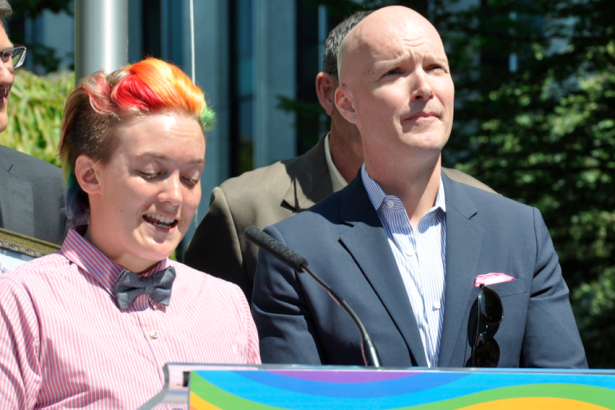 Maybe that future will look a lot like Vancouver, which is gearing up for its 35th Pride Parade on August 4. Before the proclamation and flag-raising, the City had earlier unveiled permanent rainbow-coloured crosswalks on Davie Street at Bute. Today's City Hall flag-raising event was emceed by Joan-E, with a blessing from Stewart Gonzales of the Squamish and Musqueam Nations. Lindsey, a Pride Week volunteer, told me that this year's event has "a really good energy. It's maturing, becoming more multi-faceted. It's not just Pride Week, it's Pride Season. This is a great city to be in, considering the international climate." Lindsey was referring to Russia, whose anti-gay laws have raised ire around the world. In his speech, Robertson once again slammed Russia for its anti-gay violence and discrimination. Also present was Danny Papadatos, Mr. 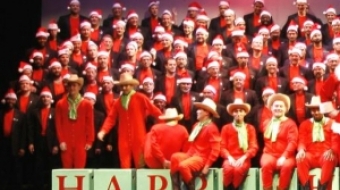 Gay Canada 2013. He swung by City Hall before jetting off to Belgium for the Mr. Gay World event. As Lindsey said, "35 never looked better." Party advice from local experts. Vancouver Olympics, again? Star Trek icon George Takei thinks it's a good idea for the gay-friendly city.